When, how and why do we become silent in the presence of the things happening around us in our day to day individual and collective experiences? What is the agency of silence and its importance or impacts as a powerful tool of communication and resistance in a society? How can I further develop my artistic practice around silence? How can I look at silence in contrast to and in relation to speech and written language as a form of knowledge production? The topic “Conversing with Silence” is inspired by the historical event in the late 19th century when Ethiopian Emperor Minilik the 2nd wisely negotiated with the citizens to make peace after he was informed that they got into a complete silence in response to his exorbitant taxation. What intrigues me is that previously the citizens’ repetitive verbal complaints on the same issue did not lead to his willingness to negotiate. To me Minilik got shaken up by the citizens’ sudden silence, which can be seen as a powerful way of communicating their grievances and spirit of resistance. I am interested in investigating how their eloquent silence brought about change in an effective way; and I am interested in comparing this historical incidence of silence with the forced silence we are experiencing now in my country as an oppressed citizen. My project will build on my existing artistic practice, including my MA work at Addis Ababa University School of Fine Arts and Design, my work in Amharic wax-and-gold poetry, and a recent artist residency in the U.S. My MA work was an audio visual project that experimented with the recorded sounds of the interviews I conducted with people in Ethiopia. When I asked them “How’s life?”, I witnessed fear to speak their honest feelings, self-censorship, gestures of restlessness as they are suspicious of their surroundings. 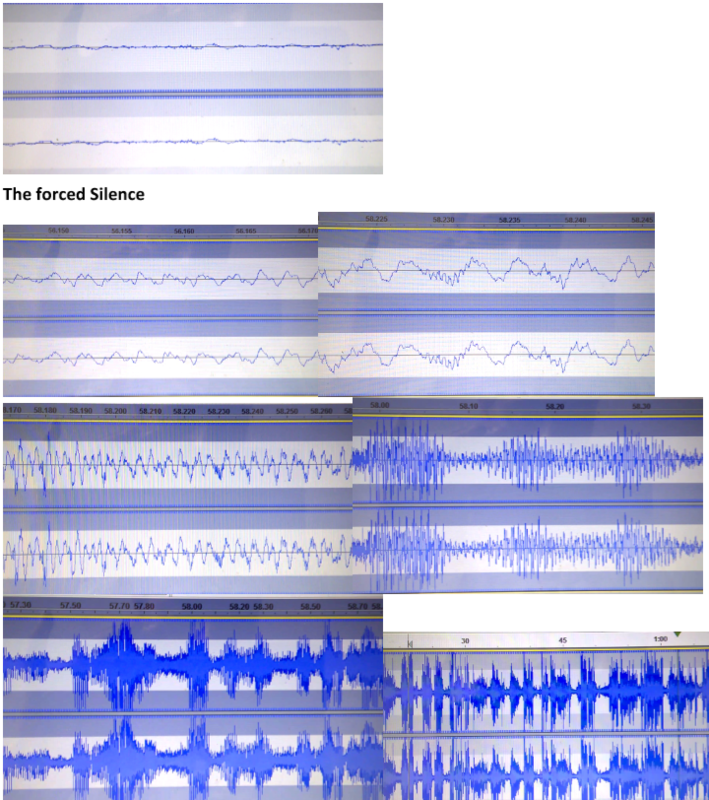 I created a visual art installation that visualized the recorded sounds of these interviews: softness, strength, anger, omission, truthfulness, uncertainty, and silence. During my residency in the U.S. in September 2017, I explored the work of John Cage, an American musician and theorist, especially his well-known piece 4’33”. In this performance on silence, the music is not played so that the sounds from the environment can be heard. Cage believed that any sound can be music; he wants sound to just act rather than to narrate. I did a video reenactment entitled ‘A Reciprocal of Cage’s 4’33’ where I played with his interview about silence by metaphorically but critically replacing Cage’s explanation of sound and music with statements about color representations. For example, when Cage exclaims, “Sound doesn’t have to mean anything!” I stated, “Color doesn’t have to mean anything!” This video performance, along with a re-staging of 4’33”, provoked questions about meanings of sound and color. These meanings are both cultural and political, and they are multiple and potent in the context of our contemporary world, especially in the U.S. where I created this piece. To deepen and further my existing work on silence, I will clarify how I understand silence as a social construction and outline some areas of investigation where I see silence plays an important role. Merriam-Webster Dictionary offers three definition for the noun “silence”: forbearance from speech or noise, absence of sound or noise, and absence of mention. I begin with the working definition of silence as absence of speech, sound, or noise, and with the emphasis that silence is never devoid of meanings. Silence communicates. It is constructed in cultural, social, and political contexts, affected by social structures of gender, class, race, and nation. Silence is made possible by speech, sound, or noise. Its meanings are shaped by the bodies’ gestures and movements, and the meanings of speech, sound, or noise that come before and after it; and vice versa. I am interested in the dialectic/dialogical relationship between silence and speech acts. Political struggles, protests and negotiation, on issues such as economic policies, ethnic relations, and gender politics: Roy Wagner‘s “Silence as Resistance before the Subject, or Could the Subaltern Remain Silent?” explores the possibilities of being silent as a performative act – “embodied actions in the world.” Can acts of resistance be sustained without verbal expressions? How can silence be used to educate oneself in the process? Knowledge production: Power and resistance are enacted through knowledge and discourse (Foucault). It is thus necessary to investigate silence in knowledge production and pedagogical practices. What is being silenced in the sphere of knowledge production and pedagogical approaches in Ethiopia? Spivak’s ‘can the subaltern speak?’ helps me develop a critique of the approach where we imitate the West without considering the importance of indigenous knowledge and scholarly contributions that can speak to its own cultural and political realities. On the other hand, can silence (or attention to it) also be an effective pedagogical tools? Artistic practice: In The Aesthetics of Silence, Susan Sontag contrasts the modern era where art has become a deliberate voiceless, random, meaningless object, with historical times when art used to be a representational object produced for spiritual or mystical purposes. To me, silence as an aesthetic can be agential, active, and deliberate; contemporary artists who critically engage with silence can be liberated from meaninglessness, to become engaged in political struggles and resistance. My own artistic practice is an example of this, in this silence-focused project. Spirituality rooted in histories of struggles: Junot Diaz also points out that silence “always asks us to move more deeply, to head towards the depths.” I offer my own example with Emperor Minilik the 2nd’s encounter with the community where silence became a tool of negotiation and a strong political act – a “methodology” (Diaz) of survival and “counterstrategy”(Diaz) in the face of crushing power. Though Diaz does not speak directly of how silence is pursued in spiritual and religious traditions, he expresses a strong desire for embodied connection with ancestral experiences of struggles. This has a spiritual dimension to it. This is why I also want to investigate on the genealogy of silence in different regimes in Ethiopia following the Emperor Minilik the 2nd historical event, how it is used within each political and cultural context, and how silence as a methodology of resistance might also connect with the religious teachings about the virtue of silence in my country. All these examples and existing texts show why is important to push the boundaries of how we understand silence; it is not just being speechless. It is important to consider the meaning of silence in its complex social contexts, instead of essentializing its meanings. The themes/areas I outlined above are not exhaustive, and they are intricately connected with each other. By combining all these views I would like to investigate silence as a social construct affected by gender, class, race, and nation, and its role in political struggles, knowledge production, artistic practice, everyday life, and spirituality. In addition to my research practices, as an artist and a poet, I want to specifically look into how art works and creative productions can contribute to such kinds of research projects. I will focus on artistic practice in relation to silence in specific society cultural and political systems by using different research methods including workshops, discussions, artistic experimentations, seminars, collaborative art projects, and performances. The PhD in practice program will provide me an important platform to engage in this work. I hope that this artistic project will encourage new findings and new perspectives on silence as an important methodology of negotiation and communication. Mihret kebede graduated from Addis Ababa university School of Fine Arts and Design in painting with distinction in 2007 and has earned her MA in arts from the same school in 2016. She has also received a certificate award of recognition as the best practicing artist in 2013 from Ministry of culture and tourism, Ethiopia. The materials that she uses have a kind of special meaning for her and take her art works half way as she stated. Mihret also writes poetry as one way of expressing herself in the pursuit of something beyond consciousness. Mihret did several collaborative poetry and jazz projects and performances with Studio Olafur Eliasson followed by her show in the studio. In addition to her painting training she uses different materials and Mediums including fabrics, threads, shoelaces, collages, menstrual-blood, nets, photography, video art, performance with a wide range of experimentation. Mihret has participated in several local and international art exhibitions, workshops, residencies, exhibitions, poetry and Jazz recital programs and collaborative art projects. Beyond her artistic practices she is also known for organizing local and international artistic events and festivals. As a continuity of her MA research art project, Silence has become her main topic that she works on and investigates as unwritten, non verbal communication, resistance, and survival and negotiation tool in different cultural, social and political happenings as well as knowledge production practices.